I’ve created my version of low-carb cream cheese pancakes and they taste delicious for a quick breakfast on the run. Lately I’ve been talking about my wife being on a low-carb diet to help get rid of some weight she gained during her pregnancy. As an avid runner she would like to get back into the gym and back to the active lifestyle she once had. Part of her inspiration comes from the popular Atkins Diet that has proven successful for so many men and women around the world. You only have to look at photos and read stories on social media sites to see how the Atkins Diet has changed lives. The most important part I like to remind my wife about is that eating should be part of a “lifestyle” and not something you do just because you think you have to do it. I’ve read all that I can about the Atkins Diet over the past few weeks including Atkins recipes so I could help my wife prepare or create her meals. Although she only went through the Atkins induction stage for 2 weeks to jump-start her weight-loss many stay on it for a bit longer to lose more weight or control their eating habits. The idea is to stay on induction until you lose the first 15 pounds then you can start adding carbs back into the diet. The Atkins induction is very strict and full of low-carb meals but if you pair this with a daily workout you are sure to lose weight. It’s maintaining the loss that many people struggle with. Losing weight and maintaining my weight is about eating clean, drinking lots of water and leading a healthy life-style which I do everyday, but I like my cheat days. My wife simply wants to get back living that same lifestyle with me. Lately she has been struggling for breakfast food ideas and getting sick of eating eggs all the time. She missed the occasional stack of protein pancakes or even buttermilk pancakes I would make her. I went looking on the internet to see if I could make low-carb pancakes and what I could do to make them taste good. Almost all the low-carb pancake recipes that I found were pretty much the same. I wanted to create something that was my own but to be honest there’s not much tweaking you can do to pancakes that are gluten-free. You can’t buy this pancake mix which I’m sharing with you today at the grocery store but most of you may already have the ingredients in your refrigerator/pantry. The ingredients include butter, eggs, gluten-free baking powder, pure vanilla extract, flax-seed meal, cinnamon, cream and Philadelphia cream cheese. There are 8 ingredients, that’s it! You can add salt and sugar substitute if you like but I didn’t bother since my wife was planning on adding sugar-free pancake syrup from the bottle she dusted off in the back of our pantry. She’s used sugar-free syrup in the past but since getting pregnant it was all or nothing for her. Alternatively you can add flavours to these cream cheese pancakes which is what I did by adding a splash of vanilla extract and sugar-free vanilla cream. After reading many recipes online I decided to try something a little different and that was to create a meringue with the egg whites and then fold that into the yolks. I thought that the meringue may help fluff the pancakes up and keep them very light. That certainly did happen but don’t expect that fluffiness to last as it won’t. The minute the cream cheese pancakes hit the plate they deflate. There is no gluten so they puff up, then they exhaust the puff but that still doesn’t change the taste. You could add a gluten-free almond flour which is high in protein to help keep the pancakes fluffy but we didn’t have any at the time. If you’re eating a low-carb diet you won’t care that your pancakes aren’t fluffy enough to touch the ceiling. You just want to dive in and eat them with some syrup. You don’t have to be on the Atkins or any other low-carb or gluten-free diet to eat these cream cheese pancakes either. Topping the cream cheese pancakes with maple syrup and fresh fruit is certainly an option that won’t disappoint. I know as both my son and I have tried these cream cheese pancakes and our plates were empty with-in minutes. I also appreciate that these cream cheese pancakes don’t make me feel like I need to be wheeled out after eating them like regular pancakes do. Don’t get me wrong I love traditional fluffy pancakes but these cream cheese pancakes are a nice alternative especially since pancakes were always just a treat for us. Make sure to heat your pan on med-high, add butter to melt then add a scoop of the cream cheese pancakes. They cook for about 1-2 minutes per side. Be careful when you flip these gentle puffs of love because they can easily fall apart because the gluten is missing. Flip them fast and eat them faster while they’re hot. Would you try these lovely cream cheese pancakes even if you weren’t eating low-carb or gluten-free? What other low-carb breakfast recipes do you love to eat? 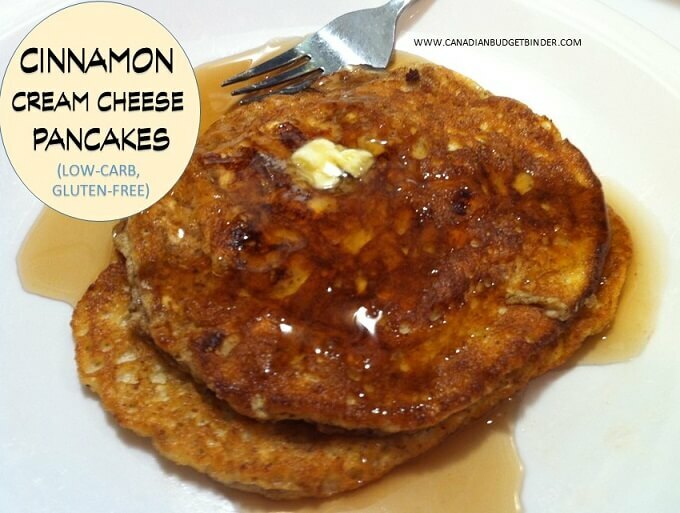 If you are on a low carb or gluten-free diet you will want to try these light golden cream cheese pancakes dripping with a sugar-free syrup before you start your day. In a medium size bowl crack your eggs but separate the egg yolk and the egg whites into a second bowl. In the other bowl add all of the other ingredients and mix until smooth. In a large skillet put a teaspoon of butter and let it melt on med-high heat. I had number 6 on the dial. If you have an electric griddle I'd keep the temperature again on a medium heat as they cook fairly fast and you don't want them to burn. Add ½ cup scoop in the frying pan and check on it often as it won't bubble like a traditional pancake will as there is no flour. Flip the pancake once it is golden brown which should be no more than 1-2 minutes a side. Add a knob of butter on top and some sugar free maple syrup and enjoy them hot! I don’t know the exact carb, calorie count for all you folks looking for low-carb foods but I can tell you that they are low in carbs and gluten-free. You can easily compare my recipe to other cream cheese recipes that have the nutritional count to get a general idea since most recipes are the same apart from the addition of flavours. I found a low-carb cream cheese pancake recipe at Nutty about Health that is similar to mine apart from the flax meal, cream and vanilla extract. This looks so delicious, Mr CBB. I think this cinnamon cream cheese pancakes would take our breakfast meal on a higher level and make my kids excited every morning as I am sure they’d love this pancake. They do look interesting!!! Not sure what diet my Sisters-in-law are on these days but I can share this with them as both are always trying to lose weight. Thanks! !